Behind the Wheel Drivers Education (State License # DT 676). You learn to drive only once in your lifetime. Why not treat yourself to the best! Is There Really A Difference In Driving Schools? YES, THERE IS! As with anything else you will find a great difference between driving schools. You learn to drive only once in your lifetime, therefore you owe it to yourself to be aware of the difference. Quality of instructors and teaching methods are of prime importance! A good, well trained professional instructor can make lessons a very enjoyable learning experience. 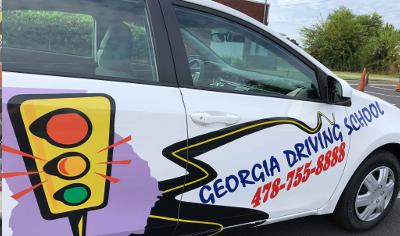 Georgia Driving School has been licensed by the Department of Driver Services since 1973 and is regarded as one of the finest professional driving schools in the nation! We will prepare you for today’s hectic world of driving! We offer our students private lessons. No other students will be in the car as you are learning. We will come to your home, school or work and pick you up for each lesson. Our instructors give special attention to NERVOUS beginners! Behind the wheel sessions are given by appointment. What you save: With the tax deduction and the insurance savings this could pay for your driver’s education course within the first year!